In Stormchaser and Lincoln's ruined world, the only way to survive is to risk everything. To face a contest more dangerous than anyone can imagine. And they will do anything to win. 5 Words: Friendship, trust, family, betrayal, survival. When I opened this book, I stepped into a different world. I could see it all play out before me as I read. 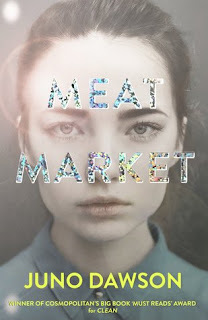 The writing is rich and vivid, the story intense and twisting. The pace of The Extinction Trials is just incredible. I couldn't stop madly turning the pages, wishing I could read faster to keep up. I couldn't help but rush through this, gripped by the story and the action. I did find myself Googling a few of the dinosaurs as they were new to me (I've always been a strictly Triceratops kinda gal with little room for anything else) and it really brought forward the research that had been done. What’s your favourite thing about the world you’ve created? The whole continent of Piloria. The fact it’s virtually unexplored and full of lush plant life and a whole host of deadly dinosaurs – who wouldn’t want to go there! If you've already read The Extinction Trials then sign up for the Usborne YA newsletter - next week there's going to be a sneak peek at book two. If you haven't read it then sign up anyway as there will be a chance to win a signed copy! Great review, Cora! The more I think about this book the more I want to reread it! 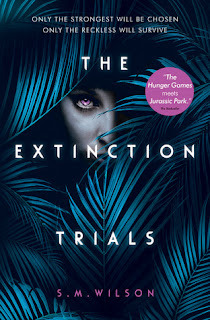 I really like the sound of this, it seems like a mix of The Hunger Games mixed with Jurassic Park haha! I had such a fascination with dinosaurs as a kid (I loved the TV show Walking with Dinosaurs) so to relive aspects of that in novel form sounds like a winner to me! I also really like what you’ve mentioned about a romantic relationship not overshadowing the story, I’m not a huge romantic so hearing that is a big selling point! I will certainly have to pick up a copy of this book!